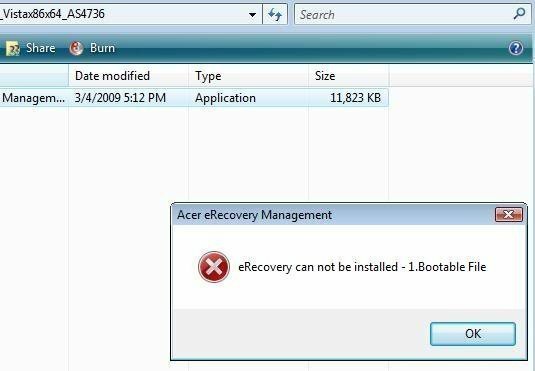 Solutions for Acer eRecovery Management problem - Acer eRecovery Management cannot install bootable file. I Want To Install Acer eRecovery Management On My Windows 7 professional Netbook but It Fail. It Say: eRecovery Can Not Be Installed 1. Bootable Files. When Acer Recovery Manager cannot install bootable file, if you want to make a system recovery image, just make use of Windows System Recovery under control panel. Step1. 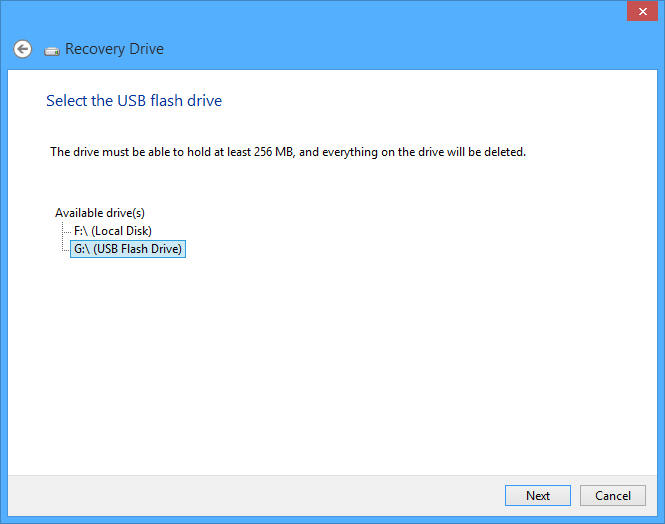 Enter “recovery drive” in the search box, and then choose “Create a recovery drive”. Step2. 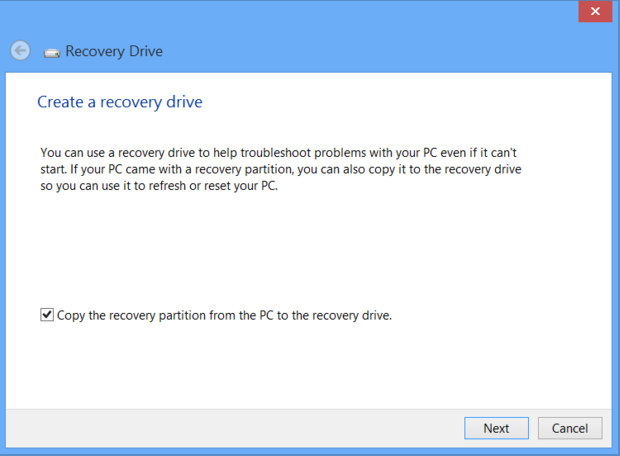 In the next screen, ensure that the “Copy the recovery partition from the PC to the recovery drive” box is checked. Step3. Plug in a USB flash drive which is large enough to contain the image file and select it as your recovery drive. Step4. Click “Create”. The recovery image and necessary recovery tools will be copied to your USB flash drive, which will take a while, depending on your PC and the size of the recovery image. Step5. When it finishes, remove the USB flash drive. Keep it in a safe place and don't use it to store other files or data. I am using an acer aspire 5517 (32-bit) laptop. It has ALOT of viruses and trojans. It is very bad. I get black screen with blue screen in middle. Words are in white something about BIOS not working and crash? I cannot log in normal screen, I must use Safe Mode. (Screen still happens just less.) I try to factory reset but I do not have a disk, USB drive, or money to buy. I try press Alt+F10 on start up and get "Edit Boot Option". Installed Acer eRecovery on website but keep getting this "acer erecovery management cannot install bootable file". I also tried to erase alot of data (documents, pictures, stuff of the sort) and uninstall unneeded programs hope it was data limit. Did not work. When Acer eRecovery Management can’t install bootable file, if you have to reset os to factory defaults, you can press F8 like when you go into safe mode. If you get an option to repair your computer, you should be able to factory reset from there. If not, you may need to buy the recovery cd's from Acer. If the factory recovery partition (OEM) is intact, the problem, Acer Recovery Manager cannot install bootable file, may be caused due to “Hard Disk Recovery” is not be enabled. Press “F2” when restart to enter BIOS to check. If not, enable it. Then, restart the pc and press “ALT + F10” to begin system recovery process. I have an Aspire 6920 running its original vista x64. I went over the trouble of uninstalling and reinstalling the entire Acer Empowering Technology software pack, and all but eRecovery was able to install properly. If you have changed the partition layout after you buy your machine, you should reformat the hard drive making two partitions and try again. Basically, for 100% success Acer Recovery Manager cannot install bootable file, it must be repartitioned as when it came from factory. There is a solution to all the cases above about acer erecovery management cannot install bootable file; that is to make use of the alternative of Acer eRecovery Management – AOMEI OneKey Recovery. AOMEI OneKey Recovery is a third party software aims at system backup and recovery, especially for make a system image and quickly restore system backup to good condition. When can’t install acer erecovery management, if you want to create an os image, you can use “OneKey System Backup” to achieve this. Once your computer fails to boot into Windows, you can immediately restore operating system from backup image file with “OneKey System Recovery”.